- By 2050, 70-80 per cent of the world’s population will reportedly live in cities - an estimated 7.2 billion people. As the world around us gets smarter and more connected through technology, the towns and cities we live in are beginning to generate more data than ever before. From traffic information to weather monitoring, the Internet of Things (IoT) is helping revolutionise how we live our lives across a number of industries. By connecting various aspects of the urban landscape to the Internet, local administrators will gain access to countless extra datasets that could help them provide better services for their citizens. These smart cities not only promise to improve the lives of their inhabitants, but also provide potentially lucrative commercial opportunities for a number of businesses. IoT data, as opposed to the connected devices themselves, is often viewed as being the real game-changer for the market and it is this information that will enable cities to deliver more efficient, targeted services. As we move forward into the future, more and more of the world around us will be connected up to the internet, helped by the roll-out of advanced 5G networks, meaning that in theory, we will be able to analyse and improve more of the world around us, using technology. With the sheer growth of smart, connected technology in recent years, becoming a ‘smart city’ is now easier than ever before. 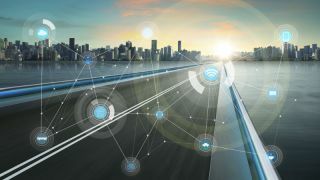 At its simplest level, a smart city will use connected technology to gather data on its surroundings using an interwoven network of sensors. These could be basic, e.g. monitoring whenever a car passes along a particular street, or developed enough to monitor precise measurements such as pollution levels in air particles. This data can then be handled either by public or private enterprises or organisations, but them utilised to gain a wider, more in-depth view of how a modern city is operating. Hopefully, the city’s governing body will then be able to use this information in order to improve certain aspects of everyday life that will help benefit its citizens. For those with deeper pockets, or bigger aims, connected technology could be used to monitor every vehicle passing along the streets to provide real-time traffic updates, or include sensors in roads and pavements to track any surfaces in need of repair or maintenance. Communications networks could also be improved in order to ensure maximum efficiency, and even buildings could be remotely monitored to ensure they don’t get too hot or too cold. As the technology evolves, there is truly no limit to the possibility that smart cities could offer. The potential benefits provided by smart cities mean that the opportunities to utilise their technology are not limited to any particular areas or locations. Here are a few cities around the world that are already using IoT technology to their advantage. India’s Prime Minister, Narendra Modi, wants to create more than 100 smart cities in the country, even though this will reportedly require investment in excess of $150 billion. Who are some of the big players in Smart Cities? Smart cities are already on the way and despite some challenges, they offer many potential benefits for citizens and corporations. Not only can companies secure huge contracts to deliver a multitude of IoT services to the city, but they could also generate revenue by selling the data that they collect, providing that they have permission to do so. What are some of the main challenges surrounding smart cities? For any city looking to embrace IoT technology, there are a number of hurdles to overcome, particularly concerning data analytics and smarter services investment. Firstly, the transfer, storage and protection of such vast amounts of data requires extremely well developed network infrastructure. Security will also likely need to be improved, particularly if some of the data associated with smart cities is of a sensitive nature. Building and installing sensors into existing urban infrastructure could prove costly and face resistance from local administrators. Why should they spend money on smart traffic lights, when the unconnected ones work fine? With all the data being collected, smart cities have also come under fire from privacy advocates. If nearly every piece of the urban landscape is collecting data, will this ultimately amount to another form of government surveillance? Cultural challenges must also be overcome for cities to work more intelligently. For example, business silos must be broken down if all the information collected from the urban environment is to be used to its full potential. There could be multiple sensor manufacturers, data owners and stakeholders involved in the creation of a smart city. All these interests must work together holistically to create a city that delivers more for its inhabitants.